Trousers or skirts should be grey, black or navy. 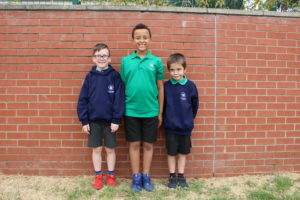 Children should always change for PE and change back afterwards. Light weight (indoor) pumps are essential for gymnastics and dance unless a child works in bare feet. Bare feet are recommended for dance and gymnastics and are essential to the safe use of climbing apparatus. We don’t allow children to wear jewellery. Small earring studs can be worn. We ask that children who wear head scarves for religious purposes wear a plain scarf in black, grey or navy. 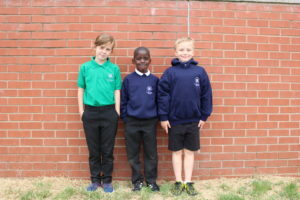 Please make sure that all uniform (including coats and shoes) are clearly labelled. Shoes should be suitable for physical activity – trainers, pumps or shoes please. Flat boots in winter with a change for indoors. No heels or loose fitting sandals. 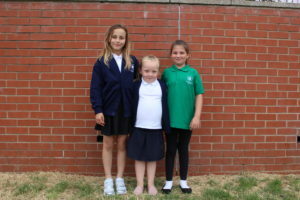 We stock uniform items with the school logo; price lists are available at the school office. Most items are also available in high street stores and supermarkets. 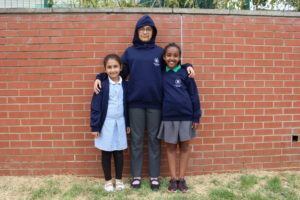 Children do not have to wear items with the school logo on. Sew on badges are also available.